This principle helps set the stage for understanding Earth's climate system and energy balance. The sun warms the planet, drives the hydrologic cycle and makes life on Earth possible. The amount of sunlight received on Earth's surface is affected by the reflectivity of the surface, the angle of the sun, the output of the sun, and the cyclic variations of Earth's orbit around the sun. The basic science of solar energy and the role it plays for Earth's climate can be understood by middle school students, but the complexities of the Earth's energy balance remains an area of active scientific research. Thus, this topic is both elemental and complex. Sunlight reaching Earth can heat the land, ocean, and atmosphere. 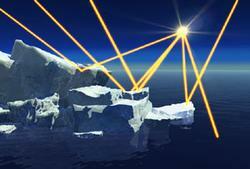 Some of that sunlight is reflected back to space by the surface, clouds, or ice. Much of the sunlight that reaches Earth is absorbed and warms the planet. When Earth emits the same amount of energy as it absorbs, its energy budget is in balance, and its average temperature remains stable. The tilt of Earth's axis relative to its orbit around the sun results in predictable changes in the duration of daylight and the amount of sunlight received at any latitude throughout a year. These changes cause the annual cycle of seasons and associated temperature changes. Gradual changes in Earth's rotation and orbit around the sun change the intensity of sunlight received in our planet's polar and equatorial regions. For at least the last 1 million years, these changes occurred in 100,000-year cycles that produced ice ages and the shorter warm periods between them. A significant increase or decrease in the sun's energy output would cause Earth to warm or cool. Satellite measurements taken over the past 30 years show that the sun's energy output has changed only slightly and in both directions. These changes in the sun's energy are thought to be too small to be the cause of the recent warming observed on Earth. Why are these topics important? The causes of the seasons. The reason ice ages occur. How the amount of energy emitted from the sun (sun's luminosity) changes over time. The sun's output is not constant. Its luminosity (total energy emitted by the sun) has increased over geologic time, and varies slightly over shorter time scales. Why recent climate warming has not been caused by increases in the sun's energy output. Most forms of energy that humans use are derived from solar energy. Many forms of energy that humans use ultimately derive from solar radiation, such as food, hydrocarbons (such as oil and natural gas), wind energy, hydroelectric power, and of course, solar energy. This figure shows the variations in Earth's orbit, the resulting changes in solar energy flux at high latitude, and the observed glacial cycles. This image was produced by Robert A. Rohde from publicly available data, and is incorporated into the Global Warming Art project. Throughout most science education programs and standards, the role of the sun in providing energy to the Earth system is included, but often in a disjointed way. The seasons and their importance in driving seasonal weather patterns and animal migration may be taught in primary school and then not revisited for many years, if at all. Another common area of confusion that many learners wrestle with is that the atmosphere and the gases that make it up have mass (over 14 pounds per square inch of pressure on top of us at sea level) and momentum. In our everyday lives, we are fish at the bottom of an ocean of air, unaware of the mass that is invisible and feels weightless above us. This confusion is difficult to overcome. Solar radiation is the fundamental energy driving our climate system, and nearly all climatic and biologic processes on Earth are dependent on solar input. Energy from the sun is essential for many processes on Earth including warming of the surface, evaporation, photosynthesis and atmospheric circulation. Thus, examining how the sun fuels different processes on Earth can be a part of many types of science courses. Many of the science concepts relating to this principle can be addressed by encouraging seasonal observations, participating in citizen science programs rooted in the seasons, and periodically revisiting the basics of how the amount and intensity of solar energy affects Earth's climate. This principle can be taught from a very basic level on upward through the most sophisticated scientific approaches. Integrating Solutions - The science concepts that relate to solar radiation can be expanded to include solar energy engineering and technology, including solar ovens, passive solar design, solar thermal energy and solar electricity. This can help raise awareness for alternatives to the use of fossil fuel and create a forum for discussions about solutions to climate change that our society can adopt. This NASA figure shows how white ice reflects sunlight while darker ocean water absorbs sunlight. Middle school students can begin to understand what solar energy is and how many aspects of life on Earth are dependent on it. Globes and other physical models can be used to show the tilt of Earth's axis and how that affects the distribution of sunlight during different seasons. (see My Angle on Cooling: Effects of Distance and Inclination) Students can learn to visualize the solar system in three dimensions, to understand changes over time, and to begin to understand that energy exists in many forms. Middle school students can also understand the basics of heat transfer and reflectivity and therefore the basics of the Earth's energy budget (see Earth's Energy Cycle - Albedo). In high school, students are ready to develop a more in-depth understanding of Earth's energy balance. Pathways of energy from the sun and across different aspects of the Earth system can show the transfer of energy (see Effect of the Sun's Energy on the Ocean and Atmosphere). Students can learn about periods of different climate regimes in the past by observing how orbital cycles and ice ages are well correlated. This approach emphasizes the use of graphs with multiple variables and an understanding of long time scales. Students have sufficient geometry and physics background to grasp the concept of the axial tilt being the reason for the season. They will attain a deeper understanding of the cause of the seasons and resulting impacts of the seasons on global climate. In the introductory undergraduate curriculum, students move on to a more detailed understanding of the various processes controlling the energy balance such as the role of clouds or albedo in controlling the energy that reaches Earth's surface (see Earth's Heat Budget). Milankovitch cycles are commonly used to introduce the concepts of the ice ages. Long term changes in the sun's luminosity can be raised in the ";faint young sun"; paradox. The concept of uncertainty can be used to emphasize that there are aspects of Earth's history and Earth's climate that are not fully understood. Upper-level college students can explore questions such as the influence of the sunspot cycle, changes in the sun's luminosity or the effects of atmospheric aerosols on albedo and climate. A quantitative approach and the use of models are useful methods to address these questions. The concept of feedback cycles is essential for comprehension of the interplay between various processes. Several CLEAN activities that teach Principle 1 fall within the energy transformations benchmark or the Earth benchmark. For more information see this article about the first principle from Encyclopedia of the Earth. Solar Radiation and the Earth's Albedo - a summary from About.com written for lay audience. IPCC Fourth Assessment Report 2007, Working Group I: The Physical Basics - Chapter 2: Changes in Atmospheric Constituents and in Radiative Forcing - scientific summary of the latest state of the scientific knowledge on this topic with a special focus on the human impact on the climate system. Is the sun causing global warming? This page from the Skeptical Science website provides clear answers to common questions and misunderstandings about climate change. McCaffrey & Buhr, 2008: Clarifying Climate Confusion. - Journal article from Physical Geography about common misconceptions in climate science. How do we teach about questions with no certain answers? - from a faculty workshop on teaching about the early Earth. Earth's energy balance since 1950 - brief summary of a recent research article from Physics Today.